The Brisbane 18 Footers are proud to be conducting the 2016 Australian Historical 10ft Skiff Championships “Bob Lundie Trophy” from 30 April to 1 May 2016. Racing is conducted in the Australian Historical Sailing Skiff Association 10ft Skiff class, with these gaff/gunter rigged wooden boats aiming to retain a sense of how sailing once was in the 1940s and 1950s. The championship will be decided over 4 races, two races on each day. 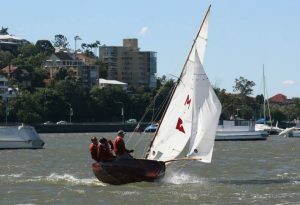 Races will be held on the Hawthorne, Bulimba and Hamilton Reaches of the Brisbane River, from the Brisbane Sailing Squadron at Vic Lucas Park, Bulimba Point. Memories from the wild and woolly 2014 Titles – Miss Marlene weathering the westerly. … and memories of Avro’s epic rides from 2012!